ORLEANS, Mass. – The array of scouts who outline the backstops of the Cape Cod Baseball League are a dead giveaway of the talent that makes up the league. MLB standouts such as Jason Varitek, Nomar Garciaparra, Barry Zito, Todd Helton, and Lance Berkman all showcased their mettle in the CCBL and others such as Ron Darling, Billy Wagner, Josh Paul, Chuck Knoblauch and Robin Ventura were all voted top prospects in the nation’s premier summer baseball league. 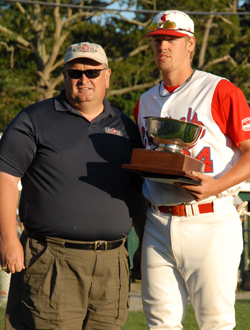 This year’s Robert A. McNeece Outstanding Pro Prospect Award was presented recently to Matt Wieters (Georgia Tech) of the Orleans Cardinals. The 6-foot-4 native of Goose Greek, S.C., had an impressive sophomore season at Georgia Tech, acting as a force both at the plate and behind the plate. The Yellow Jackets’ catcher carried his hot season from college ball into the summer as a designated hitter and catcher for the Orleans Cardinals. Wieters finished the Cape League season with a .307 batting average and eight home runs, both categories good for second in the league. He also finished second in the league in on-base percentage with a mark of .417. Orleans’ assistant coach Robb Gorr called him “the best hitter on the Cape. You don’t need the stats to see that.” Wieters was well respected by teammates and field manager Kelly Nicholson as a team player who used the Cape experience as a tool for improvement. Wieters had some truly memorable performances during his season of Cape League play. At Eldredge Park, Wieters hit a home run off of the bandstand in right center field, a shot usually reserved for home run derby participants. He also enjoyed a 2-for-3 performance during the All-Star Game, for which he was named the starting designated hitter. Wieters’ outstanding plate discipline and tremendous power gives him the ability to exceed at the next level and join the long line of Cape League alumni who have already made a mark in the big leagues.